Santa Monica– Major construction requiring freeway off ramp and street closures for Phase 2 of the Expo Light Rail Line in Santa Monica will begin Saturday, January 18th at 6:00 am and last through Tuesday, January 28th at 11:00 pm. 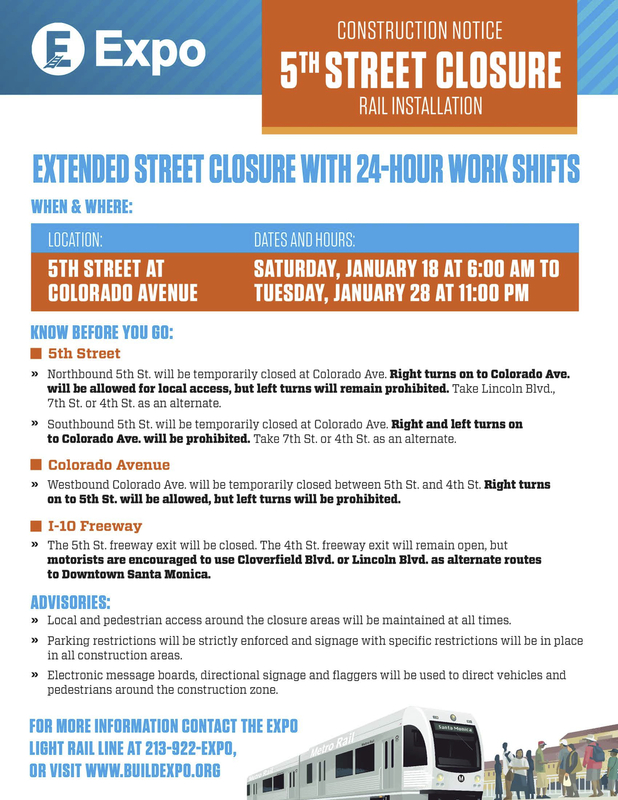 Crews will work 24-hour shifts during the extended street closure to install track across 5th Street. Northbound and southbound 5th Street will be temporarily closed at Colorado Avenue. Westbound Colorado Avenue will be temporarily closed between 5th Street and 4th Street. As part of this work activity, the 5th Street exit from the westbound I-10 freeway will also be temporarily closed during this time. Motorists are encouraged to use the Cloverfield Boulevard or Lincoln Boulevard exits as alternative routes to Downtown Santa Monica. 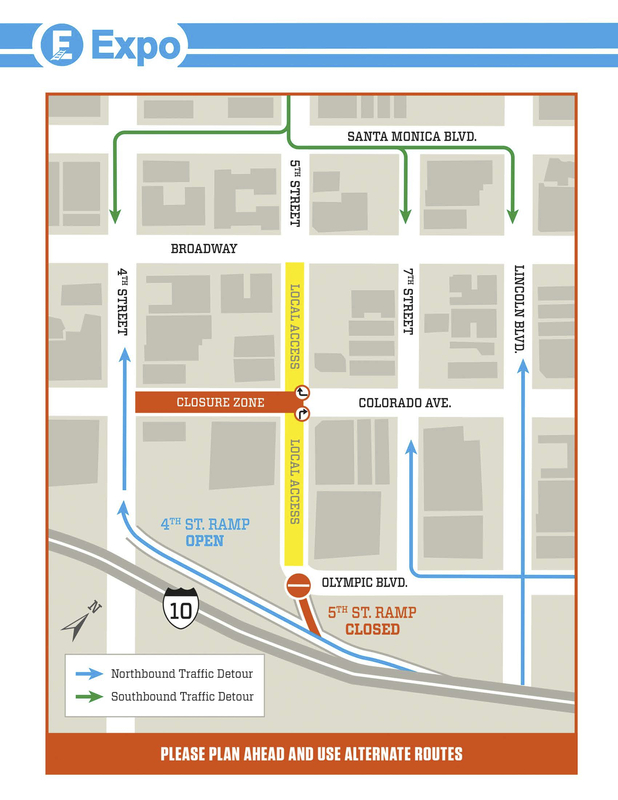 Commuters should expect detours in downtown Santa Monica, and will be encouraged to take alternate exits off the westbound I-10 Freeway during this extended closure. Local and pedestrian access around the closure areas will be maintained at all times. Electronic message boards, directional signage, and flaggers will be used to direct vehicles and pedestrians around the construction zone. For additional information about the Santa Monica street closures and Phase 2 of the Expo Light Rail Line, please contact Gabriela Collins at (213) 243-5535. Where will the 720 layover and what will be the alternate route? It’s a minor detail, but are they aware there’s no 6th Street on the map?